This week I started watching "Fashion House" the new telenovela like series that My Network TV is presenting. It suppossed to be on for only 13 weeks and then they will start a new series. 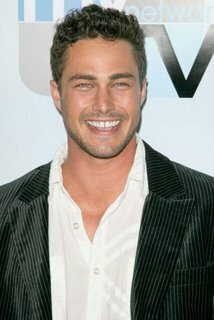 I like the idea of the show but I liked Taylor Kinney even more. He portrays Bo Derek's son, Luke. Unfortunately there are no pictures of him shirtless on the internet because he is gorgeous!